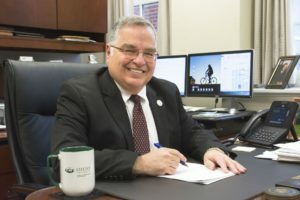 Dr. Randy Leite, Dean of the College of Health Sciences and Professions at Ohio University is the focus of our member spotlight series this month. A graduate of both Ohio Dominican College and The Ohio University, Dr. Leite stayed true to his Buckeye roots by serving various institutions in his 35 years of service in higher education (Ohio University, Bowling Green State University, The Ohio State University at Marion, Otterbein College, and Ohio Wesleyan University – view his full vitae here). He is currently a member of 7 different professional organizations with his longest affiliation being with NCFR / OHCFR (since 1996). + What is your current position? What does your job entail? I am dean of the College of Health Sciences and Professions at Ohio University. In that role, I provide leadership for all academic, research, and service activities for a college enrolling 9,400 students across 15 academic disciplines. I oversee an operating budget of $39 million, raise money to support our programs, and facilitate college outreach efforts in our region, the State, and around the world through our Global Health Initiative. Information about the College can be found atwww.ohio.edu/chsp. I’ve also facilitated the development of the Ohio Alliance for Innovation in Population Health with colleagues from the University of Toledo. Information can be found at www.ohiopopulationhealthalliance.com. + Where did you get your education, and in what field? I have a Ph.D. in Human Development and Family Science from The Ohio State University. + What inspired you to go into the field? I became intrigued with family dynamics and the powerful influence of families on child and adult outcomes while enrolled as a doctoral student. As a result, I switched from a program in education to the HDFS program. + Do you have mentor or was there someone who really helped you out in this field? What was it that they offered to you? My earliest mentor in the field was Patrick McHenry, a professor at Ohio State at the time I was there. Pat helped me to appreciate the broad scope of family impacts and issues, helped me to understand how to think as a researcher, and shaped the course of my career after I completed my academic program. + What are your particular interests within this field? If you do research, what are some of your recent research projects about? My earliest work was on nonresidential fatherhood and factors associated with father involvement with children in nonresidential settings. Today, I am much more interested in child and family policy, the policymaking process, and the impacts of policy on child and adult outcomes. As a dean, I do not get to do much research. What little I do tends to be as part of research teams focusing on understanding policy and best practice around responding to opiate abuse as this is an epidemic in our region and our state. + What has been your best experience(s) working in this field, or what do you feel is the best part of doing what you do? The best part of being a dean is that I have the opportunity to shape the direction for a large college and our many programs and then see the impact of what we do on our students. Every year at our Commencement programs, I get to shake the hands of over 2,000 students as the graduate and move into their careers. This is incredibly gratifying. I also have the opportunity to shape the many outreach activities of our college and, through those activities, get to tap the resources of our college for the benefit of populations in need in our region. + What has been your biggest accomplishment? During the past seven years, we’ve grown our enrollment from 2,500 to 9,400 students through a variety of transformative decisions. As one of the largest health-focused colleges in America, we can bring considerable resources to bear in addressing various critical social issues and in preparing the next generation of professionals across our disciplines. + What do you find troubling or frustrating about your position? By far, the biggest frustration I have is associated with financial resources. This is a particularly difficult time for higher education as State support continues to diminish, tuition is frozen and the cost of what we do continues to escalate. So much of what we can do to be innovative and have an impact on our students and our region requires financial investment to support start-up costs. + What do you still hope to accomplish with your work? I am fairly late in my career so I am not sure how much I will be able to accomplish in whatever time I have left to work. I am trying to facilitate our college becoming defined around innovation and community engagement and will continue to focus on those as aspirational goals. + How has the field changed since your entry? I would say our attention to family issues has become far more sophisticated as we develop and utilize new and complex strategies to research family issues, far more complex theoretical orientations, and increased sources of data on families. We’ve also moved away from an earlier focus on normative versus non-normative family comparisons to complex explorations of variations across all families. I believe this reflects the dramatically changing family demographic patterns we’ve witnessed over the last two decades. + What do you feel is the future of Family Science in Ohio? I believe it can be strong if those in the field embrace cross-institutional collaborations that pool resources, are open to research and teaching that reflects the very real issues that exist for families in our state and our nation, and are willing to undertake increasingly sophisticated research that directly engages community issues. + What advice would you give to a student considering going into the Family Science major? This would depend on why they are doing so. If they want to be a practitioner such as a child life specialist or a certified family life educator, I would stress to them that they must use their time as students to seek out experiences that will differentiate them from others in the field so they will be most competitive for positions. As an example, we currently have approximately 200 students who are pursuing a child life credential at Ohio University. Those who will be successful in finding professional positions will be the ones who find a way to stand out. For those who want to be a researcher, I would stress that they should find a strong mentor and research collaborator who can facilitate their entry into the community of scholars and then seek positions that will offer them considerable support in establishing a dynamic research program. I believe research is most successful when it is done in very collaborative, relational ways. + What advice would you give to a new generation of graduates going into the field? Beyond what I stated in my previous response, I would also suggest that they remain open to new perspectives and new ideas. For new practitioners, strive to understand the experiences of those who have lived very different lives than you and the needs that may exist for them. + What is a “must read” book for those interested in Family Science? As I am very interested in the diversity that exists among families, I would suggest books that explore the impacts of race, ethnicity, poverty, and location on families and their members. I just finished reading White Trash, which is a history of social class in America. I also just finished Being Mortal, which explores end-of-life issues around caregiving and decision-making for elderly family members as they face inevitable physical decline. I believe this issue of caring for aging family members is rising to the level of a defining crisis in family life today. + What is your most used or go-to Family Science resource? I find many great resources on various extension system websites. I also believe NCFR offers a number of wonderful policy briefing materials. + To what professional organizations to you belong? + What do you like to do in your free time? I spend a lot of time riding my bike. There are some wonderful roads in southeast Ohio. I also spend a great amount of time with grandchildren. + How do you practice self-care? What is your favorite way to de-stress? Quiet time at home in the evening. Reading books that are thought-provoking but not directly related to my work, spending time with my grandchildren. + What do you do to effectively balance your work and family? Probably not enough. I spend about 12-15 hours a day on work activities including a number of hours at home in the evening.